It is widely thought that Catholics are terrible in retaining members, and that Catholics are leaving the Church in droves. It is a fact that there are about 22.5 million people in the U.S. who were baptized and raised Catholic, but who no longer self-identify as Catholic. A huge number to be sure. But to be fair, the Catholic Church is huge to start with. There are 68 million Catholics in the US (in 2011), a number that dwarfs the second place finisher, Southern Baptists who report 16 million. Then come Methodists (7.6 million), then Mormons (6.1 million), etc., et al. In other words, the biggest Christian Church by far is the Catholic Church and the second biggest Christian denomination by far is “Former Catholics.” Some, most actually, leave for nothing, others join other denominations, mostly Evangelicals, of many varieties. But while our overall number of drifters and those who have departed is large, our actual rate of retention ranks significantly higher than any Protestant denomination. Over at the Center for Applied Research in the Apostolate (CARA) blog there is a significant amount of data presented [HERE]. Among the data is the Table at the upper right. 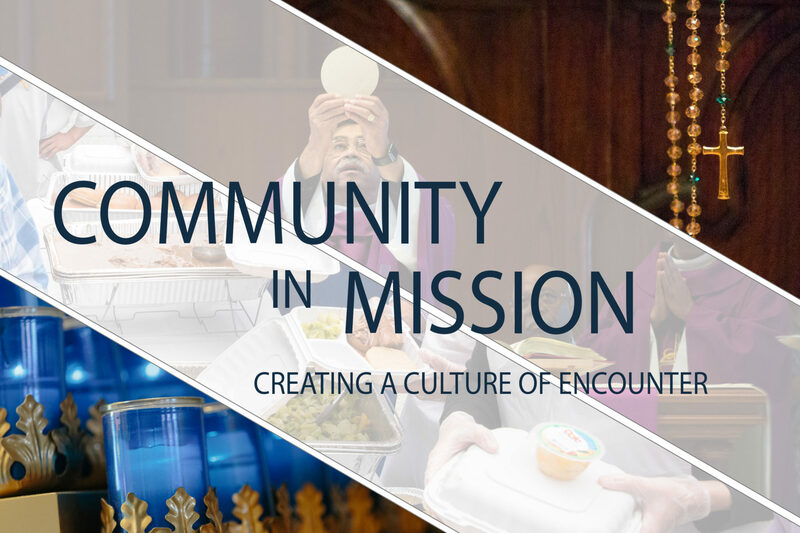 It will be seen that Catholics retain 68% of those baptized and raised in the faith. 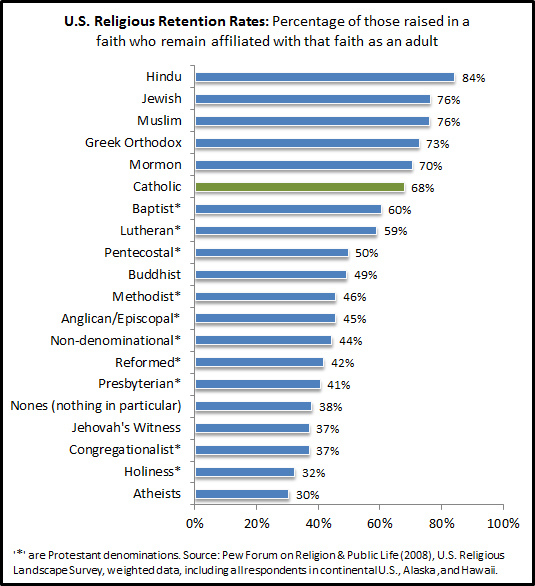 This number is well ahead of all Protestant denominations, and as you can see, the Jewish people, Hindus, Muslims, Mormons and Greek Orthodox rank ahead of us in retaining members. But take a special look at that number at the bottom of the pile, yes the very bottom. Atheists “retain” only thirty percent of their “flock.” To quote the CARA blog: And if you think it is challenging to be a Catholic parent, try being an Atheist parent! Some 70% of Americans raised to believe God does not exist end up being a member of a religion as an adult (about one in five former Atheists drift off to become an open-minded agnostic or None). N.B this number reflects only those raised as Atheists. A large number of Atheists in this Country are “made” in the sense that they were raised to believe but now are Atheists. It remains to study how many of them remain atheists and for how long. But as for those who are raised Atheist, the vast majority of whom later reject that atheism, Wow, and what a relief too. Why? I remember the venerable Archbishop Fulton Sheen observing many years ago that “Atheism is acquired.” In other words, no one is born an atheist, and atheism is not natural to the human person. Even the most casual observer of the human scene must accept that belief in God, is a natural and ubiquitous human trait. It therefore makes sense that Atheism, while a phase many pass through, it not usually an enduring state. We are spiritual by nature and “wired” to see beyond the merely physical, to the metaphysical, beyond the merely material to the mystical. So there it is, we were made to know God, and God never stops calling! And in our infinite longings (something a finite world cannot give), and the deep drives in us toward goodness, beauty, truth, justice and the search for ultimate meaning, it makes sense that Atheism has a hard time holding the day. Atheism is not our natural state, it is an acquired malady, a woefully, reductionist, materialist and inadequate explanation for us who are wired for the spiritual, the mystical, the eternal; yes, wired for God Himself. 70% of Atheists reject it, for some form of faith. Therefore, do not give up, when it comes to evangelizing those who call themselves atheists. Stay in the conversation, even with the most militant. For remember militancy is often a sign of inner struggle. Remember too, they are made to know God, wired for the spiritual, and God is calling in innumerable ways. Let me know your own thoughts at why Atheism has such a low “retention” rate. Too bad no unbiased source backs up this claim. This source is so biased that the word “unbiased” is being underlined as a misspelling by this site spell-checker. Classic. Just like hoping something like God is true doesn’t make it so? Ah but there is so much evidence! God doesn’t need us to hope him into existence if as I believe he exists so that is silly. I think you have to have a certain level of arrogance to be atheist. One would have to be so willing to focus on themselves and believe we are all just chemical accidents to deny even the possibility of a Creator. It does not even appear logical to deny the existence of God. Doubt would be logical since I don’t know how you disprove His existence to a certainty. One other comment talked about the intelligent people moving to atheism. I say we let atheism have the intelligent folks and God can have to open minded and hopeful. We can pray that the atheist become mor eopen minded and find some hope. I always find that statement deliciously ironic when it comes from people who think they have a personal relationship with the creator/supreme overlord of the universe. Cleve: you confuse arrogance with Faith. The delicious irony I see is that atheist even read Catholic blogs. The only logical conclusion is that they want to sneer as those who believe so they feel superior. Again that arrogance and sneer reflex kicks in. I wish I could be as intelligent as you Cleve. I will just have to stumble along as God made me. Steve, Another way of looking at it is that atheists who frequent such blogs as this are actually, though probably subconsciously, searching for meaning in life. As for the arrogance and sneering you mention; I’ve always found such things as betraying a certain insecurity, whether they come from an atheist or believer. Mr. Pope, you have to understand that there is literally zero scientific evidence for a God. I totally agree that there is an abundance of “miracles”. Things so beautiful it takes your breath away, lives saved by a hair’s breadth, etc. etc., however our existence on this planet and all the things that got earth (and the rest of the universe) to this day, can be explained by science. This is not to say there /isn’t/ a God (I am a ‘none’ who would like to believe that there is one), but I am also an intellectual who knows that any existence of one is not present in the physical. There will never, ever, ever be a physical example of God. There will never be any evidence. Belief does not constitute evidence, and I don’t believe that that constitutes arrogance. The world humbles me, and I would love to believe I’m not a meaningless speck (a chemical accident), but I know that regardless of the metaphysical, my physical can exist based solely in scientific evidence. And I agree with Steve in that it’s pretty arrogant to feel like any one person “knows what god would want”, yet a fair amount of hatred comes out of religious bodies (and I’m not clumping all christians with the worst offenders). And David, think what you will about folks looking for meaning, but I think you may be misleading yourself. Many people read blogs like this because they want to absorb and retain knowledge and be involved in the world. I’m reading this right now because a dear friend of mine posted it, and though she is Catholic and I am not, I care about what she cares about and I am always interested in rounding out my education. You did notice that the chart is from Pew, right? Yeah, I didn’t think so. Athiest in a foxhole here…no matter how bad it go over here, I never turned to god, but my own mates for support. Your mates won’t last forever, though. Then what? You and I won’t last forever, either. Then what? For me, the Bible has good answers- not myths, either. Ps 146, from the Douay bible, which is accepted here. “Put not your trust in princes: In the children of men, in whom there is no salvation. His spirit shall go forth, and he shall return into his earth: in that day all their thoughts shall perish. It says your mates won’t last forever. “But the just shall inherit the land, and shall dwell therein for evermore.” Sounds like myth, don’t it? A well-thought-of person from history believed it. Given the nature of most of the comments, and pretty much everything I see vis-a-vis interaction between atheists and believers (certainly on Catholic websites), perhaps the fundamental question to be asking is “what do we even mean by “God”? Because when it comes to a lot of atheists, what they cite as “God,” or what they perceive to be the “God” we profess to believe in, from the Flying Spaghetti Monster to anyone tripping bashing up against a wall and calling it “God” (instead of calling one’s self clumsy), this is not what Catholics, at any rate, believe to be God at all. What if your tears are your belief and express your longing for God? Perhaps you should seek the help of a local priest or someone who can give you wise council. Firstly-atheism is not a religion.-here’s an analogy atheism is a religion in the same way that off is a television channel. Secondly-you stated that some atheists go from atheist to agnostic/none. None means atheism-so you can add those numbers on. Thirdly-Those that are agnostic are simply saying they do not know. We are in fact all agnostic unless extremely deluded because you cannot know (insufficient evidence for or against). Even if you are agnostic, you will either be a theistic agnostic (believes in god-doesn’t specify which OR a believer who accept there may not be a god after all [but still believes]) or atheistic agnostic (acknowledges the possibility of a deity, but does not believe). Very few sit on the line in the middle. Therefore you should use this data to create another table which illustrates the retention of theistic vs non theistic views whilst including which side of the line the individual agnostics are on. Has this been published as an experiment in a journal?-if so, do you mind sharing peer reviews? 1. I think atheism is a religion, or let’s just say it is a theological position. It is a view wherein man is god, and most of them believe that everything came from nothing and results from a mindless chancy process called natural selection. This is a metaphysical stance since the material evidence for the mechanism posited by atheists cannot be proved by science or some other technological process. And your “off” position fails since atheism takes a position on God and today especially that station is coming in loud and clear. If atheism was not a channel, then how would you and I be having this discussion, your channel is on the dial. Also, you may have noted that I put religious in quotes, since I understand that calling atheists a religious group is novel, but they are a religious category since they have a stance on God. 2. “Nones” means those who believe in God but are not members of any particular church or denomination. Hence they DO believe in the existence of God and should not be numbered among atheists who say they do not believe in the existence of God. 3. This is not a statistic about agnostics, but those who identify as atheists. I am not an agnostic (as I use the term) because I can know something with great certainty by faith. Faith is a way of knowing and faith is evidence of things unseen. In fact most of what we (you included) know, even regarding the natural world, is by faith, since we cannot or do not have the time to personally test every fact. as for your last point, I might recommend you go to the CARA site which is peer reviewed etc. and is using data collected by other reputable collectors of same such as Pew et al., but you can ask specifics like that there. Msgr. Pope, I believe that if you look up the definition of atheism you will find that it is not a religion and truly means a non-belief in god – all gods, not just yours. The burden of proof of the existence of something is on the one making the claim. You cannot ask somebody to prove something doesn’t exist, in other words “if you can’t prove that my god doesn’t exist then that is proof my god does exist”. Russell’s teapot. I really don’t think any atheist believes that man is god. As far as everything coming from nothing, nobody is making that claim. It’s unknown what happened or existed before the big bang. Remember your god created everything, meaning he was existing in nothingness. It took him six days to create the earth but a snap of the fingers to create 100 billion galaxies. Talk about making something from nothing. The chart you cite has little meaning, the vast majority of atheists were not raised as atheists but theists. Also the percentage of people in this country that claim to be atheist/agnostic is about 4% (12 million people) but in the Pew report about 6.3% (19 million) were secular unaffiliated so potentially 10% (30 million) of the population leans toward the atheistic. To be fair about 16% of the US population is unaffiliated with any religion making that the second largest group in the country, not too far behind the Catholics. Yes, but my point is that the claim there is no God is a theistic stance and, as you point out can no more be proved using materialist methods or physical science that can the existence of God be proved via those same methods – God is spirit. You can simply shift the burden of proof to theists alone and claim you have no burden of proof whatsoever, but your are not entitled to merely dismiss yourself in this manner. For you do make a claim that is bold on the face of it, and that does require either proof of its reasonableness, namely that despite the existence of creation there is no creator. Atheists do not claim to simply not know what happened before the big bang, (that is the agnostic position), rather, they claim there is no God, and generally assert no creator, no intelligence and that random, mindless mutations are responsible for all the order we plainly observe. But in the face of order and every level (from the subatomic all the way to complex and interrelated life forms, insisting on no intelligence whatsoever, not intelligent guiding principle, simply random chance mutation, posited as the cause, is a claim that also carries a burden a proof. It is more than a shrug or a theory, it is presented and insisted upon by materialists and atheists as an explanation worthy of belief. The chart is of limited value, and I point that out in the article, and yet it remains fascinating since Christians are often criticized for our lack of retention of our young as they grow older. The chart illustrates that the problem is more than a Christian one. Msgr to change the definitions to suit your case is disingenuous to say the least. You Sir are a theist and someone who finds no evidence for god or gods is an atheist. That atheist has no ritual or dogma where is the religion? Not collecting stamps does not make you a stamp collector. God is a spirit, fine, the evidence for that position is what? An atheist simply states they fine no evidence of a god or gods, angels, or any other such being and wants evidence to support the position that those thing exist if that is your claim. From that point there is no atheist position. Your explanation of what atheist’s believe or not believe is based on your misunderstanding of the definition of position and it seem you have added by a lack of understanding science for good measure. Atheist have no dogma based on science or any thing else other than they would like evidence for theistic claims. I was raised in the church but have taken the position that there is no evidence for god or gods for over 40 years. I study world religions and New Testament history, if there is a god then show yourself, being god to show it’s self on a physical plain is not out of that god’s abilities. Ah yes faith, to believe that which I have no evidence for, sure that’s all I need. Msgr you are an educated man, you understand that anyone making a positive claim has the burden of proof to show evidence for the claim, otherwise I claim there a fairies at the bottom of the garden, prove they are not there. Not sure what you mean by disingenuous in this case, maybe you’re just using a big word to sound smart? I am quite genuine. Atheists have a theistic opinion and it is in the very word. Stamp collecting is on a little different plane than theism. Things like philosophy and theology are different however. For example to say “I have no philosophy” is to have a philosophy. To say “there is no God” is to have a theology, a religious perspective. Faith is the evidence of things not seen. I have plenty of evidence that God exists. I experience his power in my life, I enjoy his creation, I feel his presence in my day and have tested his word in the laboratory of my life and found it to be true. Beyond the many personal evidences in my life I would add that creation is evidence of a creator, intelligibility is evidence for an intelligence who impressed that intelligibility on things and intelligibility is the metaphysical premise of the physical sciences. Further, longing for the eternal and a other non material things such as justice, truth, goodness and beauty are evidence to me of the existence of the non-material and of the soul. I have also experienced not a few miracles in my life and in the life of others. When you say there is “no evidence” what I think you really mean is that there is no evidence you will accept, but for me there is a lot of evidence. As for your final point of there being fairies at the bottom of the garden, I don’t think I would ask you for proof of that since “proof” is not what is needed or even what can be provided in the post-Cartesian world of deep doubt. Tell me one thing you can really “prove” as most moderns use that word today? In the post-Cartesian world of radical doubt, you cannot even prove I exist, for you might be dreaming, and will wake up and find I don’t exist and that you in fact are a wholly different person on a different planet. Hence “proof” a word that no longer has its 13th Century meaning when Aquinas and others used it. Rather, I suspect the best you and I can do in having a discussion is to talk about evidence. And, as I have said, I have lots of evidence for God which you are free to accept or reject. I am not sure what evidence you would provide about the fairy in the garden, but I suspect what I would have to do is weigh that evidence and also see what you mean by “fairy” for perhaps you really mean an angel or a demon, or perhaps you are analogously speaking of a life force that I call God. At any rate I would surely look for evidence and then weigh that evidence. But it seems to me that you reject that there can be any evidence. You are right, I am an educated man, but that does not mean I accept each of your formulas. I repeat what I said earlier, to make the positive statement “There is no God” despite the fact that the vast majority of people see a lot of evidence for God and DO believe, is not a position that has no burden to present “proof” (or as I would say, evidence). Just because you say you have no burden of proof does not mean you don’t or that I am an uneducated man. If I am standing and looking at an ocean and you say it is not there, just because my statement is positive and yours negative does not mean I alone have the burden of proof. You do too for you make a claim for the non-existence of something that is quite plainly obvious to most others. And God’s existence is quite plainly obvious to most human beings on this planet, both now and going back into human history, so you DO have some burden to supply evidence that the One most of us depend on, hear from and experience as quite alive and quite powerful is not in fact there at all. I think he is only trying to say that the study (and yourself) seem to be unclear about the distinction between, and possibly even conflating the two common uses uses of the term “atheist”. The majority of atheists simply lack a belief in deities, and may cite a lack of experimental evidence in support of the existence of particular deities as (weak) evidence against their likelihood. This position is also sometimes called “agnostic atheism” or “atheistic agnosticism,” and is characterized both by a lack of belief in deities and a lack of positive belief in the absence of deities. A (very small, I believe) minority of atheists also assert positively that there are definitely no deities. The majority, in turn, are just as skeptical about the beliefs of these few, again citing lack of experimental evidence. The former group should encompass the apatheists, and may encompass the ignostics, although some members of the latter group do assert certain positive beliefs. Members of both groups should be considered irreligionists, since none agree to any prescribed rituals or doctrines as jminion pointed out. I would agree with you that the latter group (“strong atheists”) do have a theistic position, and I would be interested to hear that the studies made sure that the group labeled “atheist” consists only of members of this group. However, it seems like it would be difficult to distinguish children raised to believe in the absence of deities from those raised to believe in the lack of evidence of deities, since a child might find the distinction hard to follow, so I’d want to know what methods were used to tell them apart. Furthermore, I think a study that determined the attrition rate of those who have called themselves atheists after having shrugged off the religions in which they were raised would be much more interesting of which to see the results. Since members of this group are the most likely to be calling themselves “atheists” later in life, and probably the most likely to be “militant” as well, a high attrition rate would provide much stronger evidence for the underlying point of this article. (“Therefore, do not give up, when it comes to evangelizing those who call themselves atheists. Stay in the conversation, even with the most militant.”) For myself, I expect that the attrition rate from this group is as low or lower than that of Catholicism. What We Can’t Not Know, by J. Budziszewski gives an excellent discussion on this theme of our natural disposition to belief in God from a the perspective of natural law reasoning. I think that his work, if it finds a larger audience, will go a long way to rehabilitating this tradition. There is an unbiased study showing that younger generations are freeing themselves from religion to atheism, also those who are more intelligent “flock” to atheism. 1. How many atheists are responding. I wonder why an atheist would be reading here? 2. The need to pick at the data, calling it biased – with no evidence of such. This attitude suggests a defensiveness and I wonder what that is about? I just seems to me that a true atheist wouldn’t care what Christians were saying or thinking and certainly wouldn’t be reading or caring what an obscure parish priest like me was reporting. Atheists participate because Christianity is influencing the policies of the US government. There are religious interest groups lobbying to exclude the theory of evolution from science textbooks. This goes directly against the scientific and intellectual progress of America and (in my opinion) is highly corrosive to our future as a world power. And yes I believe in God and I think there is something more than meets the eye in this world, but you have to respect other people’s rights and freedoms. 1. I was reading reddit.com/r/atheism and this came up as a topic. there is an error called scientism wherein all reality is reduced to the material only. You are a classic voice for that. Where do you think your obsession comes from? If there is an upswing in atheism I cannot say, but I doubt it will last, it is not the natural state of the human person, sociologically speaking. These are two separate things: Scientism is an inappropriate placement of all meaningful knowledge claims as scientific (or the appropriation of fields towards the empirical sciences). A certain kind of materialism is that the only substances are material substances, and the immaterial is either eliminated outright or reduced to material substance. The former is epistemological, the latter is metaphysical. You are right, though. These people come from r/atheism– for the most part they have an unexamined materialist and evidentialist (maybe even scientismist) bent. They don’t have much of interest to say, just ignore them Msgr. Raised Catholic, Atheist for 23 years and counting. Still praying, God still pursuing! My guess is that you had a (some) bad experience(s) with the Catholic Church when you were younger, or that you observed some bad examples/hypocrites in the church. Unfortunately, the Church is composed of saints and sinners, who will be sorted and judged in the end. But the Church has changed alot in the last couple of decades, so I’m told (I’m a fairly young convert). My mother-in -law was fearful about going to confession after having been gone for a long time, but when she finally went, she was very pleasantly surprised, and loves to get to Mass when she can now. You may be surprised if you go check it out today. As Msgr. Pope said, God is still calling! Actually, I have wonderful memories of being an altar-boy and an incredible education with all credit to the Catholic institution. I never had faith or even a belief in anything and that unfortunate fact eventually led me to atheism my junior year of undergraduate school. I have been in conflict with creationist for many years but it is only recent that I also now have my eye back on the Catholic Magisterium since Pope Benedict has taken the helm. Thanks Msgr Pope for bringing this to our attention from a source we know we can trust. This is very interesting. I have a friend who told me he is an atheist…he’s a very good friend who loves nature and the outdoors. I asked him. If he was really an atheist, where did all this nature come from? What was the source? Why is the law of entropy (disorder) being reversed every time any type of life is created?…things going from a less ordered state to a more ordered state. St Paul, in the beginning part of Romans, tells us we can know God from His creations. He thought for a while, and admitted that he believed in a “Higher Power”. He had his own reasons for rejecting religion, which he shared with me, but he still had the knowledge of God written on his soul. I think his love of nature is his search for God. That’s great news about believing in a higher power, that’s something the Holy Spirit can definitely work with! Just to help you make your case stronger, the law of entropy is not violated by evolution or any other process posited by atheists. The law states that entropy increases for any process in a closed system… but the earth is not a closed system. It is under constant bombardment with solar energy, for one. So scientifically, there’s no problem there at all. Law o. Entropy is not being violated. The Earth is not a closed system, energy is being pumped into the Earth continuously from the Sun. Look at the Solar System as a closed system and entropy is being maintained. Your misunderstanding as to how entropy works is common. One of the respondents stated that intelligent people are flocking to atheism. I consider both my wife and I intelligent, we both have professional educations, and we both are Catholic. Actually, my wife was non-Christian and converted just this Easter. Looking at my own life, having been a cradle Catholic, “left”, and then returned I can use my own experience. I know, the atheists/agnostics will cry ‘Bias!’, but sin keeps people away from the Church and G-d. Without G-d, there is no sin, without sin, we are given the “freedom” to do whatever we want, without consequence. We are able to sate our passions without the responsibility. But what I believe most is this, G-d gives us so much; but atheism gives nothing, rather it tries to take away faith and I suspect that those who are hurt/angry and embrace atheism, fuel their hurt/anger, and then turn it outward toward G-d, the Church, and the faithful. “1. How many atheists are responding. I wonder why an atheist would be reading here? Curious indeed. A couple of years ago I took a religious studies course at college in which we were required to read works by prominent atheists. I was taken aback at their seemingly rabid attacks on the ideas of religion/God. Reminds me of a story Bishop Sheen used to tell about a woman standing up in the front St. Patrick’s cathedral yelling at the congregation that there is no God. Bishop Sheen came out and calmly said to her something like – young woman I am glad to know of your belief in God…No one can rail so loudly against something he/she doesn’t think exists, it would be foolish. I don’t think you meant to give me a giggle this morning, because this is not a facetious topic, but I do have to laugh. I believe that Mark Twain said there were lies, D*** lies, and statistics. Of course, we only hear about the Christian faith losing members in the media it is the simplest conclusion, but no one looks more deeply into the numbers, and sees that Atheists have an even more profound problem. Thanks for sharing. Raised Anglican, left the faith for 30 years, considered myself an atheist, returned to the Catholic church. My husband was raised with no religion — he converted to Catholicism at the age of 46. Our children converted at the same time (they were 7 and 9). From my observations, atheists have a longing for God but they do not necessarily recognize it as such. I certainly filled a certain emptiness in my heart with work, family, leisurely pursuits, but I did not feel whole until I returned to Church. Now, I’m still deficient, but I have peace. God even uses my weakness. I pray when I can do nothing. I’m not surprised that atheists leave their thinking … all around the beauty of God is astounding and awesome, and falling in love and being in love with God is the natural state. You said it perfectly — we are made for God. And I thank God He never stops calling. We pray daily for the conversion of all, and esp. the members of our family. From my observations, atheists have a longing for God but they do not necessarily recognize it as such. I see now, Vijaya, that you already made the same point as I did below. The greatest theologian in the Church was officially a pagan for much of his early life. Or was he? It is true that Augustine did not accept Christ and baptism until dabbling in various other beliefs, but is it not right to say that, in his search for truth, he was always on the right path? It just took him a while to get on the main road, so to speak, but it was that hunger for truth, that desire to know what is, that was already a sign of Christ in his heart, even if he did not realize it. So too there are a number of atheists — those who do not believe, and who we might distinguish from the anti-theists, who will not believe — who think that they do not believe in God, but in their good faith desire to know truth, they already have a nascent belief in the “I am.” The spark is there, ready to be enflamed. On the web-site where I play chess there are various chatrooms, for example for Swedish chessplayers, chess variants, opening theory, etc. There is also an atheist/agnostic chatroom. It is known for having almost no activity in it at all. Atheists/agnostics, however, flock to the Religion/Theology chatroom. This is similar to how some atheists/agnostics suddenly appeared to post comments on this blog post. One reason that atheist retention may be so low is that it takes more energy to not believe than to believe. Oddly, I know many, many people who were brought up in some sort of faith and left it behind (including myself). I know nobody who was raised as an atheist and then became religious. Granted, my experience is personal, and not global, but I know a lot of people in a lot of places, having traveled a lot and having friends all over the globe (and speaking 4 languages doesn’t hurt). You’d think if these statistics were true, I’d know at least one former atheist, but I know none. I know many, many formerly religious folks who are now atheists. Could be the circles you walk in. I personally know a lot of former atheists and am acquainted with even more. I myself though not raised as an atheist, went through a brief time in high school when I doubted that God existed, not sure I was a formal atheist, but I would have called myself one. I also know some former Catholics and, as my article points out, they surely are out there, and not in small numbers, though, as the data point out, the percentage of them is not as high as some think, it is just that the Catholic Church is quite large to begin with. Spending the 1st 40 years of my life as an atheist myself I know many ex-atheists and quite a few that our also now Catholic bloggers such as myself. We have a tendency to be self-selecting so our sample sizes are pretty small and I am sure tony is correct in what he sees around him. I was also wondering how many people say they are Hindus or Jews or Catholics, but don’t really practice. I know lots of “in-name” Hindus and Jewish people (it’s more of a cultural thing than religion for them) but amongst Christians, I’ve been very impressed with the Mormons. They really pass down the faith to the children very well through their life. Any atheist reading this should consider that this Church that is Catholic, not only claims to have been founded by Christ, that the Bishops are the descendents of the Apostles, but that God is Present in a piece of Bread. How could something so unbelievable, be so believable for millions and millions. And something so profane be so successful in art, science and history. That’s kind of like resolving not to teach your child English so that they themselves can choose what language they want to speak when they’re adults. This is a poor straw man. Language is a necessary social instrument to function in society. Religion is a dogma, a belief system. A better example would be to compare what it looks like to indoctrinate a young child in a different belief system. For example, how does it sound to, tell your friends that your child is a Republican or a Democrat? I’ve dealt with atheists here and there. A many of them are believers more than they know. Many of them have all of the pieces of the puzzle, but they just haven’t put them all together. And besides, God speaks even to the hearts of atheists, even if they do not recognize the voice as His. My my, this little report, certainly has gotten under your skin General Patton. The main reason some of the Protestants have horrible retention rates is they tend to, though less and less in the mainlines, practice something called church discipline. Instead of letting people stay in the church as lapsed, backslid some such members, they might ask them to leave. Many churches nowadays tend to let people stay in when they are living unrepentant in sin, and just turn a blind eye towards it, thus have high retainment rates. Thus people like the Kennedy’s, Pelosi and other such ilk are welcomed in every week to the Roman Catholic church, and the Anglicans can have a Muslim pastor in Seattle, and gays in the pastorate in all sorts of liberal denoms. Where there is more of an eye to sin and a firm hand in dealing with it, there will be more people leaving, either because they are asked or they are offended; but either way the church is stronger for it. This doesn’t really strike me as true, especially as regards the Protestants. Mainline Protestant churches are NOT retaining members, they are leaving in droves. Some down by more than a third in the last 10 yrs. They are leaving for churches where sin is still condemned, repentance urged, and have traditional standards of morality. Denominations splitting; Anglican, Lutheran, Presbyterian, Methodists are close. Well, atheists try to live on a black and white/life and death/physical view of life without considering the purpose of our existence or the nature of love. They try to convince us that we should not ask ‘why’ or ‘what next’ because they say there will be no answer. A bit of dead end really. (1) The education the children receive is unchallenged. And much of that education is about the dire consequences of leaving the religion. (For Catholics, lose access to God in a piece of bread, loose access to forgiveness of sin and so on, Muslims – the penalty for apostasy is death ). (2) The social segregation means that leaving the religion means leaving a closely bonded and distinct group and joining the ‘other’. For Jews, leaving the faith is not just an intellectual choice but a betrayal of their ethnic destiny and a compromise with the persecutors of their forebears. It’s the kind of indoctrination various modern ideologies have attempted to emulate – Hitler Youth for example, the youth movements of communist states – but without the centuries of practice of the religions. Very few people are ‘brought up’ atheist and those atheist parents who might want to indoctrinate their children with atheism (few do) have nowhere near the established social structures and practices to do so that the religious do. The education the children receive is unchallenged. And much of that education is about the dire consequences of leaving the religion. In 13 years of Catholic grammar school and high school, nothing even close to the above was taught. If anything, the Jesuit education I received went too far in the opposite extreme of bending over backwards to diminish the uniqueness of our Catholic faith. Furthermore, this assumes that most people raised Catholic or Jewish receive primarily Catholic or Jewish educations. Most Catholic children do not receive their schooling in Catholic parochial schools. For Jews, leaving the faith is not just an intellectual choice but a betrayal of their ethnic destiny and a compromise with the persecutors of their forebears. Clearly you’ve never met a former Jew. As a Roman Catholic from childhood and presently a senior citizen my view on this is that faith is a gift from God. Although it is accessible to all mankind, not everyone will receive the gift. Some will be so opposed to it that they will build an impediment that is impenetrable while others will welcome it with such open arms that they will devote their life to espousing their faith; even, as some have, they will give up their life rather than deny their faith. As more than one great philosopher has said; “faith is belief in the unbelievable”. God exists. Jesus walked on earth expressing His ministry, was killed on a cross, came back for 40 days to guide his apostles on how to continue the ministry, then returned to His father. Anyone who reads The Acts with an open mind can come to no other conclusion on the existence of God. Yet, some will defend every detail of the historical writings that described Ceasar’s Gallic Wars or Columbus voyages to HIspaniola but completely discount the eye witness accounts of Jesus life, how the Apostles were inflamed with the faith instilled in them, and as Peter said; we must give witness to the Resurrection. A man died and came back to life–Unbelievable! But God, killed on a cross rose from the tomb, ate and drank wine with his friends, and continued his teaching. Completely believable. How could those who personally lived that experience not believe in the reality of Jesus as God. How can I in this 21st century, reading their accounts not be convinced by their willingness to die for their mission be so ignorant as to discount their story and accept the library shelves full of history books on the thousands of other events of the past for which there is no living person today that witnessed them. Thank God for the faith to accept these facts..
We have no eyewitness accounts of Jesus life. None. Same for Julius Ceasar and Charles Darwin. There is not a single person alve today who saw them with their eyes. Funny that a dude named ear is calling for eyewitnesses. You know, come to think of it ear, I dont know of anyone who was sees you either, none, you must not exist. Are the Gospels of Mathew, Mark, Luke, and John not eyewitness account of Jesus life on earth? An eyewitness account means the recording of events of those who saw the events. The recording does not have to be by the witness, just a recording of someone who did witness it. Consider any such deposition today in a court of law as examples for this. However in this case we are even closer to the fact. John did walk with Jesus. Likewise, Peter whose activities are recorded by Luke in the Acts. How do you come to the statement that there are no eyewitness accounts? There are eyewitness accounts of Jesus that are as valid as any of the eyewitness accounts to the actions of any other historical figure from ancient times. Or do you suggest that Jesus did not exist and his life story is fictional? The books in the New Testament are the most attested to documents of antiquity. There are almost 6000 ancient manuscripts of the NT the eariest dating to about 300 years after Christ. The next most attested to would be the Iliad by Homer where there are 700 surviving manuscripts the earliest dating to 900 years after the original. There are only a handful of copies of Julius Caesar’s Commentary on the Gallic Wars, the earliest dating 800 years after the original. Yet no one questions the authenticity of the eyewitness account given by Caesar. This doesn’t even include the secondary sources that refer to the bible and even there the bible outshines its peers. There is more eyewitness evidence for Jesus Christ then there is for Alexander the Great. I guess Alexander was all made up also? Yes, thanks Andy, I think the assertion that Jesus Christ never existed has to embarrass even most atheists. I understand that an atheist would not accept that he was divine but to assert, as “Ear” does here that the historical figure, Jesus of Nazareth never existed at all is major “kook patrol” “tin foil hat” kind of stuff. Again, I suppose even most Atheists would be embarrassed by such a silly claim. Likely “Ear” is just trolling. But again, Andy Thanks. It has long been fashionable for young adults of college age to espouse atheism and/or agnosticism. It’s a peer thing. Later, when they’ve matured and become more confident, people are free to return to faith and to God. That would explain, at least part of, atheism’s retention deficit. Why do religious publications suggest that science is the confirmation of WHAT YOU WANT TO BELIEVE?! Every scientist knows about confirmation bias–that is why it requires two or more independent studies to validate results, the study obviously omits the results of the negative hypothesis. Unless you are a professional, “statistics” get too much of publicity and not much investigation. Usually the more sensational story gets the attention, even if it’s disproved by future evidence. Go on, be happy and believe what you want. Reality bites-and if it doesn’t get you directly, it will get your descendents. They will blame you. I don’t know of religious publications that do what you say. As for reality, time will prove where wisdom lies. From my experience of Atheists (My husband is one…) It’s more personal experience / events and disappointments which lead them to this non-belief than anything else…. There is no science in this world which has been able to prove that God does not exist… Only human beings embittered by events or disillusioned by lack of proper answers in their lives that propogate atheism…. Belief in God requires belief in the supernatural. Science is the study of nature and is not capable of examining the supernatural. It is an oxymoron to require that there be a scientific explanation for the existence of God. There is an incongruity in the argument of Atheists to require “proof” of the existence of God. Atheists do not accept the supernatural. Acknowledging God is inconsistent by definition with Atheism and its fundamental beliefs so it will never happen. The issue with Atheists is accepting the reality of a supernatural domain and such acceptance can only be based on faith, not science. An Atheist may become a Theist, but a committed and true Atheist cannot acknowledge the existence of God while remaining an Atheist. But “faith” does not mean “blind faith”. Human reason is capable of deductively concluding that there must be more to existence than birth, growth, and death. The shear improbability of the complexity of the universe with its intricate coordination of elements, to have occurred by chance is enough to convince me. Human reason also demands that in the natural order of things there can be no effect without a cause, therefore this effect; i.e. our existence in the universe, which is totally in the natural domain, must have had a cause; therefore that cause can only be supernatural. The ancients “got this”, and even the ritual pagans got this. They gave their various names to the gods within their capacity to imagine the supernatural. However, there came a time when God did visit earth, assume the human nature temporarily, and walk among humans in the natural order of things. He did this to teach a small group of Apostles the truth so that through them the truth could be passed on to the entire human race. Some will accept it and others will reject it, that is our free will. But to accept it one must think rationally, be open to the call to faith, and be willing to live a life consistent with the message Jesus gave in his ministry. Love God and love your neighbor. Atheists reject all of those prerequisites. the claim of the atheist about the use of natural reason, or intelligence or scientific inquiry and method as the fundamental basis in discovering and understanding the world is wonderful…and i think its correct. in doing so, an atheist must acknowledge and “pay homage” to some really important men of Science. Father Bacon (experimentation), Father Boscovich (modern atomic theory), Father Ricciolli (acceleration of falling bodies), the Jesuit (seismology) and many others…all Catholic, God-believing and loving men of faith. Also note that Hindus and Jews often identify as such due to their ethnicity, not due to their religious beliefs. Hindus and Jews that join other religions or embrace other religious beliefs will still often identify as Jews and Hindus. That is the reason why their retention rates appear much, much higher than they actually are. Next PostNext Too much stuff!